We find out how accountancy skills led to securing a contract with FIFA. Defending a company from cyber risks is no longer the sole responsibility of the IT department. We spoke with ICAS members Down Under to find out how long-haul business and home travel is best survived. Investigating how audit can be used to make important issues tangible and bring greater value for a natural wonder. 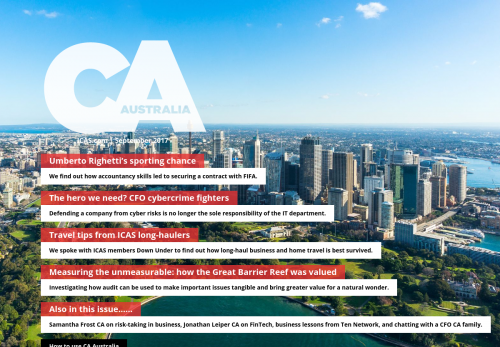 Samantha Frost CA on risk-taking in business, Jonathan Leiper CA on FinTech, business lessons from Ten Network, and chatting with a CFO CA family.